A Foggy Bottom resident for the past four years, Tom Sullivan has served as the volunteer website manager for the FBWE Village since before the official launch of the organization. Every week, he updates the site with new stories contributed by members about Village activities. He also works with board members to come up with ways to improve the site and overall communication with Village members. Tom was born and raised in Wilmington, Delaware, and graduated from the University of Delaware with a degree in urban studies. After graduation, he found work at the University library which turned into a lifelong career path in library and information science work, which in turn led to his experience in building and maintaining websites and databases. It was while working at the UD Library that he became active in local organizations, including the Newark (Delaware) Historical Society, for which he was a founding member and the organization's first secretary. After 10 years in Newark, Tom left to travel Europe (and beyond), picking up a variety of additional work experience along the way. This included stints as a night porter in a tourist hostel in Scotland and as a farm laborer on a privately operated communal farm in Israel. During this time, Tom alternated work and travel that included Scotland, Malta, Spain, the Netherlands, then-Czechoslovakia, Austria, Israel, Ireland, Egypt, Cyprus and Turkey. After two and a half years living out of a backpack, Tom returned to the US where a brief visit to an old friend in Washington turned into a new job opportunity as a courier for one of Ralph Nader's public interest groups. He has been a District resident ever since, including stints in Capital Hill and Dupont Circle. Now a DC resident for nearly 25 years, Tom lives in Foggy Bottom with his husband of 21 years, TJ Myers, a veterinarian with the US Department of Agriculture. Some Villagers also know TJ as the leader of the FBWEV seasonal bird-watching walks. 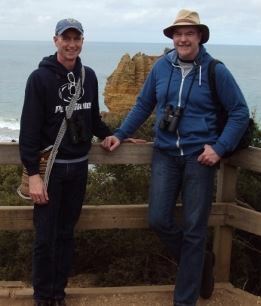 In their free time, Tom and TJ enjoy going to Nats games and traveling, especially to places with large populations of birds. Birdwatching trips have included Australia, Rhode Island, Maine and Washington State, but they also enjoy urban bird watching, both in DC and on an especially memorable tour through New York's Central Park. "We were walking through the park at 6:30 am with our guide, just us, some really dedicated joggers and a few really sketchy people." They especially love the east coast of Delaware, which is home to many bird sanctuaries and wildlife preserves. Many of their vacations are spent in their condo in Rehoboth. "Delaware is a great bird state," says Tom. Tom is also active on the board of Potomac Plaza, where he lives. He's worked on projects such as the new "green" roof on the building, and making the building more accessible.